Big news might not seem like big news. It certainly didn’t when we met up with Ski-Doo engineers in January in a secret location for a private test session aboard the new 2020 prototype. When we entered the shop that was full of Ski-Doo Summits, we quickly scanned the area for the new secret weapon. We didn’t see it. And that seems to be the reaction that many fans are having as we write this just a few days after the global launch of the 2020 Ski-Doo Summit lineup. Many sledders on social media are commenting that they just don’t see the big change for 2020 in what Ski-Doo ambassadors and marketing is clamoring about. They’re wrong. We’re here to tell you that a very significant new sled was sitting among the crowd in that Summit-filled shop: the 2020 850 Summit X with Expert that was designed with Carl Kuster and Tony Jenkins. That’s the advantage a viable industry media has over a social media page using reposted photos to sway public opinion: we rode it. Our opinion is based on actual experience and seat time. We’ve pounded the Expert through whooped-out single-track, blasted through trees on off-camber sidehills, popped over open creeks and dug trenches trying to hang onto our line until the next cluster of pine trees opens up. So when we say the shorter tunnel makes the sled handle like a completely different machine than the Summit X, or that the removal of the snow flap completely alters the track’s efficiency of getting traction in deep snow, we base that on three staff test riders having ridden the Expert (and the Pro RMK Khaos, and the Alpha One…) the way we ride every other mountain sled we test. It’s not conjecture. It’s our profession. 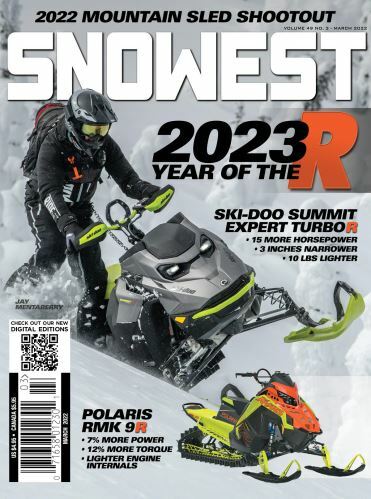 With that out of the way, here’s what the SnoWest test staff had to say following our test sessions on the 2020 Ski-Doo 850 Summit X with Expert.